Nearly 2,400 acres on Lookout Mountain and into Johnson's Crook in Dade County, Georgia, have been preserved and will be managed by the Southeastern Cave Conservancy Inc. as the new Charles B. Henson Preserve at Johnson's Crook. "This is just the beginning," SCCi Executive Director Ray Knott said. The property immediately becomes one of the biggest private conservation projects in the region. If it were a state park, it would be one of the 10 biggest in Georgia. For comparison, the Lula Lake Land Trust Core Property is 850 acres, Reflection Riding Arboretum & Nature Center is 317 acres, and the Lookout Mountain Conservancy has preserved 1,900 acres. The biggest nonprofit or private conservation in the area is the Tennessee River Gorge Trust, which owns 6,000 acres and protects about 17,000. Last week, SCCi announced it received a donation of the land from an anonymous donor and Georgia-Alabama Land Trust Inc. The donated property was once slated to be used for the The Preserve at Rising Fawn, a development that ultimately failed. The preserve was to be a cabin resort to draw visitors from Atlanta with an equestrian center, swimming pool, fine dining, trails and a luxurious spa, according to Times Free Press archives. Some residences and cabins were built. The project was touted as a mini-Pigeon Forge and hit the market in 2007. The vacation resort's 2- and 3-acre lots were purchased by about 300 people, most from out of the area, according to archives. The project was eventually exposed as a $40 million mortgage-fraud scheme that resulted in federal prison sentences for its masterminds, Josh Dobson and Paul Gott. Now, a grand entrance gate, some homes, cabins, ruins from an unfinished town community center and beautiful land are what's left. Several large scenic ponds, rolling hills, countryside, pasture and Lookout Mountain shape the property. One of the partially finished buildings is rotting and will be torn down. The other is in various stages of decay, but the inside is largely in repairable shape. There's an unfinished pool, what would have been a grilling area and once-pristine wood now rotting. 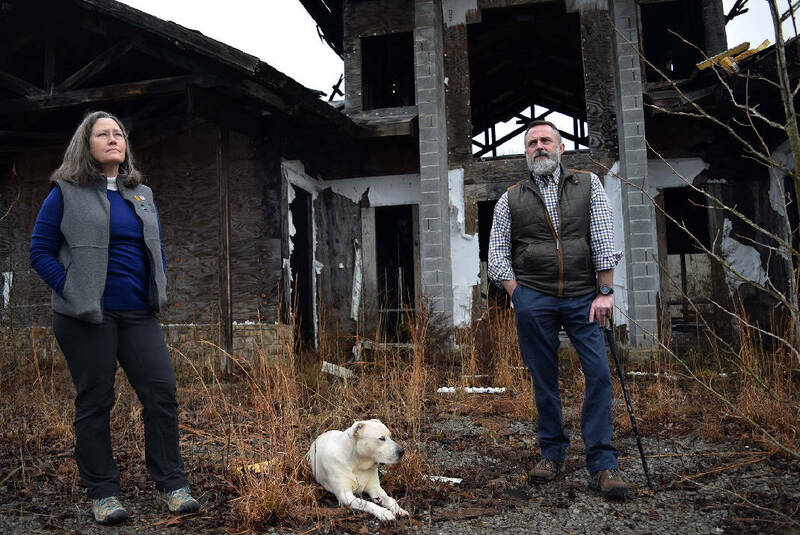 However, Knott and preservation manager Patty Springer plan to rehabilitate and rebuild the deteriorating community area into a 10-acre park. The two see what the area can become. They envision picnicking in the hills overlooking a large pond as children play in the countryside beneath the slopes of Lookout Mountain. The Georgia-Alabama Land Trust protected many parcels of the failed development as they became available. It holds a permanent conservation easement on all the land. Other land was given by an anonymous donor who purchased it and donated it as a tax write-off. "I can't tell you how thrilled I am that this project all came together," Georgia-Alabama Land Trust Executive Director Katherine Eddins said via a statement. "The importance of preserving Johnson's Crook first came to my attention 15 years ago, and it has been gratifying to see land once slated for development preserved in its natural state." The conservation is named after Springer's late husband, Charles Henson. "He would tell you he was just a boy from Murphy, North Carolina, who loved the outdoors," Springer said. His recognition of the risks of development and an opportunity for conservation began the efforts to protect the land more than 15 years ago, Knott said. He also donated land in Trenton for the very first SCCi cave — Howard's Waterfall Cave Preserve.